Rubies have been a favored selection in jewelry for centuries. That tradition continues here at Knox Jewelers, were our patrons select this gemstone to embody love and passion in their custom creations. Ruby’s intense red color is desired for its beauty, rarity and the emotions it stirs. In ancient Sanskrit, ruby is referred to as ratnaraj, or “king of precious stones.” This title has endured throughout the ages, as rubies have come to represent wealth, power and passion; hence their wide use in royal jewelry. Apart from their chromatic allure, ruby is also a practical choice for jewelry worn on a daily basis, like an engagement ring or wedding band. Corundum, the mineral name for ruby and other shades of sapphire, is ranked 9 on the Mohs Scale, and is hard enough to withstand everyday wear and tear. This being said, it is not indestructible. With our custom created engagement rings and wedding bands the possibilities are endless when considering incorporating a colored gemstone. Customizing your engagement ring with the inclusion of a romantic ruby will make it a truly personalize, one-of-a-kind piece. Listed below are just some of the ways this crimson gemstone could be featured in your favorite ring settings and bands. Choose a rich hued ruby in your preferred size and shape as the central focus in any of our custom solitaire rings. This intense center stone can stand alone and offer a bold, classic look. Select a vintage inspired setting with the addition of a ruby center stone to create a romantic engagement ring with ties to the past. 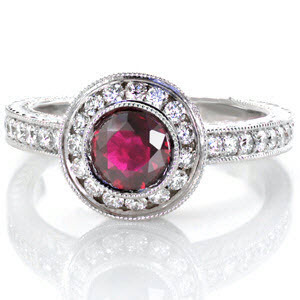 Add vintage character with a diamond halo design featuring a contrasting colored ruby center. 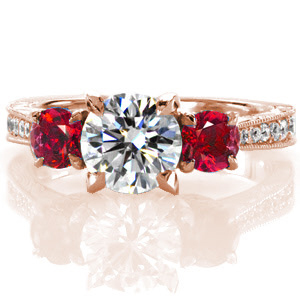 The juxtaposition of diamonds and a scarlet center stone creates a dynamic engagement ring. Get the best of both worlds with a custom engagement ring featuring a diamond center stone framed by saturated ruby accents. A three stone ring setting is the perfect way to incorporate gemstones while still selecting your perfect center diamond. Our truly unique wide band rings offer the room to experiment with the addition of colored stones. 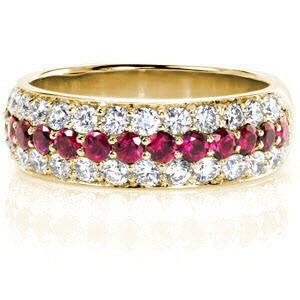 Rubies with definitely stand out in a wide band design no matter where you decide to incorporate them. Their intense color plays well with any shade of gold and the gemstone comes to life when placed against dazzling diamonds. 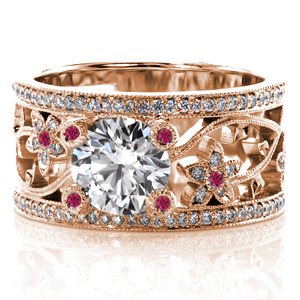 One of the most creative ways to include hints of rubies is their inclusion in a wide band engagement ring. Small colored stones could be scattered within any wide design. The combination of a brilliant center stone, side diamond and side rubies would create a true work of art. If a traditional diamond engagement ring is more your style, use the addition of your wedding band as the way to display colored rubies. 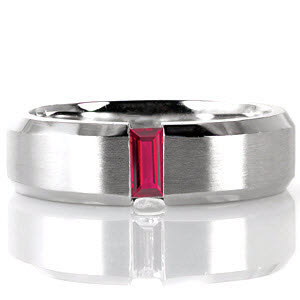 Any of our custom wedding band style can be modified to feature rubies or other colored sapphires. Wedding bands are a great medium to display birthstones, anniversary stone or any colored stone with sentimental value. Men’s bands should not be forgotten when considering the addition of colored gemstones. A dynamic ruby could make your custom gent’s band a one-of-a-kind creation. 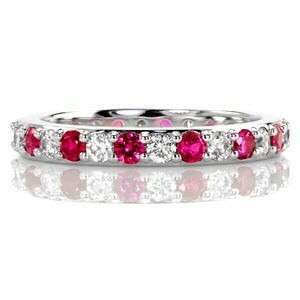 Rubies bring to mind love and passion, the perfect addition to a wedding band. Contact Knox Jewelers today and let us help you select the perfect ruby to complete the ring or band of your dreams. 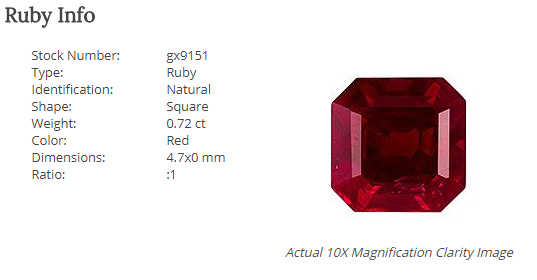 Every ruby is unique, and we can search for any shape, size or saturation you have in mind. Make your custom engagement ring a truly one-of-a-kind creation with the addition of special colored gemstones. Greenland – Deposits found in Greenland are not yet producing for commercial use but they are considered to have great potential. 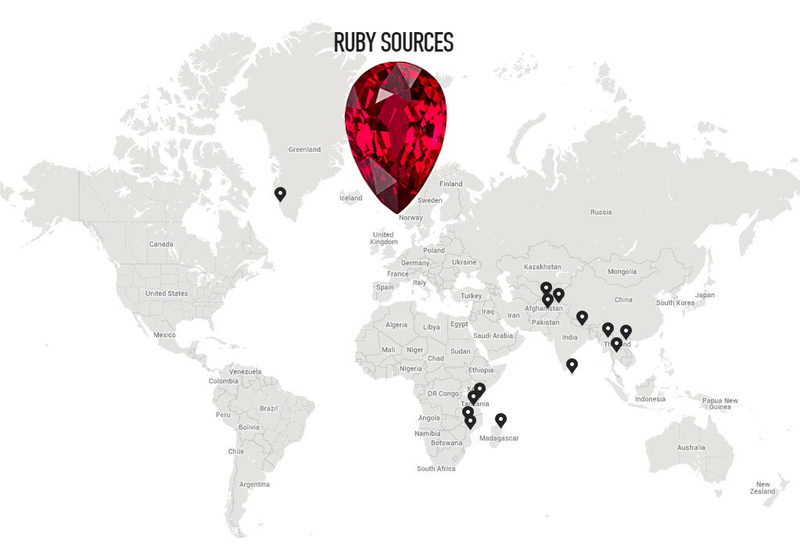 Mozambique – In the past, most ruby mining has been done by solitary miners in Mozambique. Now the mining company Gem Fields is partnering with the country’s government to regulate the gemstone mining here. Malawi – Rubies as well as warm colored pink, orange and purple sapphires can be found in the Chimwadzulu Hills of Malawi. Tanzania – Tanzania is an important mining country for many gemstones including ruby. Kenya – The South Tsavo National Park in Kenya holds the fully mechanized Rockland Ruby Mine. Madagascar – Andilamena is an important ruby producing area on the island of Madagascar. Sri Lanka – Sir Lanka is known for is sapphire and ruby production, mostly from alluvial (secondary water) deposits. Thailand – The ruby deposits in Thailand were the major source of the gemstone in the 1980s, though they are no longer producing today, the country is still major cutting and trading site for the gem. Vietnam – The new mining source for rubies, the Luc Yen area is known for its high quality gemstones. Myanmar – Myanmar has been known for its mesmerizing rubies for centuries. The Mogok Valley region may be one of the most famous ruby deposits to date. They are know for their deeply saturated, beautiful gemstones. Nepal – Some rubies have been found in marble deposits in Nepal, but no significant pockets yet. Pakistan – Most ruby mining in Pakistan takes place near the famous Hunza Valley. Afghanistan – The ruby mines in Jegdalek, Afghanistan are often left inactive for periods of time due to war, lack of security and government regulations. Tajikistan – Some rubies from Tajikistan carry rare intense red fluorescence that can even be noticed in daylight. If you are lucky enough to hold the king of gemstones, ruby, as your birthstone, let us at Knox Jewelers help you custom create a one-of-a-kind piece to showcase this beautiful color saturated gemstone. 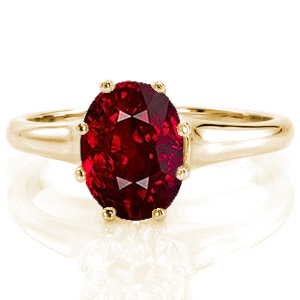 Ruby is one of the most significant gemstones in history, loved for its intense color throughout the centuries. 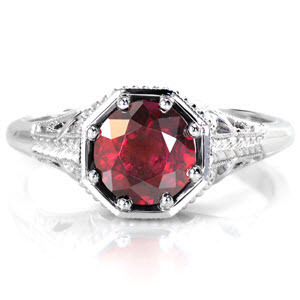 Any custom piece of jewelry could be tailored to incorporate this remarkable crimson birthstone. The possibility are endless with such a passionate and colorful mineral. A Knox Jewelers custom created piece, featuring a beautiful ruby is the perfect way to celebrate any occasion falling within the month. Contact us today and let’s get started. We can always search our cutters’ inventory for your perfect gemstone, or we have a selection of incredible rubies already available just waiting to be transformed! Author Katie MonsonPosted on July 10, 2016 September 29, 2016 Categories Unique Engagement RingsTags Birthstone, custom birthstone jewelry, Custom engagement ring, custom jewelry, found, july birthstone, knox custom creation, Knox Jewelers, Ruby, ruby foundLeave a comment on Where is Ruby Found? A ring created at Knox Jewelers is truly a piece of art, tailored to your exact specifications and built from the ground up. Any Knox custom engagement ring can be created around the exact measurements of the gemstone you hand select to feature as its center piece. This ensures that the gemstone you select will fit perfectly into your custom setting, as if they are one. There is no manipulating a ready-made setting, with the risk of an ill fit and potential loosening of your gemstone in the future. We work diligently to bring together a great variety of diamond and gemstone options in hopes that we can provide the center stone of your dreams. We update our online gemstone list weekly with newly discovered treasures. One center stone choice that is not listed on our available gemstone list, but is still a great option for a beautiful centerpiece, is an alternative lab created gemstone. We have a source providing lab created emerald, ruby, sapphire and alexandrite selections. Knox Jewelers' Verona solitaire setting shown with both a round cut natural blue sapphire and a lab created Chatham blue sapphire. Gemstones created in a lab are chemically, physically and optically identical to those mined from the ground. The only thing different from this gem and a genuine gem is that it was created in a lab and not found in the Earth. They have the same chemical composition, appearance, and durability. They may even have a richer color and a higher clarity because they were created with their given gemstone’s optimal characteristics in mind. Colorful, vibrant gemstones featured in personal jewelry have always created a romantic and one-of-a-kind look. Every color and luster of stone holds its own meaning to the wearer. Unique and saturated colors are to some a badge of wealth or accomplishment. The royal and the famous have always had an appetite for vivid jewels. On a smaller, personal note, a colored stone could represent a birthstone, hold a symbolism or simply be a favorite hue. Yet some of these gemstones are rarer, harder to get, and quite expensive. That’s why lab-created gemstones are available as alternatives. The more expensive and hard-to-find natural gems in jewelry, such as sapphire, emerald, and ruby are favorite lab-created stones. They are not gem imitations; lab-created gemstones are the real deal. They are grown in a laboratory, following naturals recipe, and are identical chemically, physically and optically to natural gems. Knox Jewelers' Verona solitaire setting shown with both a round cut natural emerald and a lab created Chatham emerald. The mineral composition of lab-created stones is created through a process similar to what nature does beneath the earth over millions of years, but in a lab at a fraction of the time, and for a fraction of the cost of mining. The average person, one not familiar with natural gemstone traits, would find it very difficult to tell the difference between a natural and lab created gemstones. Even for one trained in the gemstone field it usually would take high magnification or other instruments to be completely convince of a natural identification. The largest difference between the two options is that a natural gem typically has inclusions from the crystallization process during its creations. Gases and other minerals can become trapped during the molten stage of gemstone creation, and become an inclusion in the stone. Because lab-created stones rely on a steady, controlled process of applying minerals, heat and pressure, they usually have fewer to no inclusions. Knox Jewelers' Verona solitaire setting shown with both a round cut natural ruby and a lab created Chatham ruby. If you choose to feature a lab created gemstone in your custom created ring, you will receive a high quality stone with fewer inclusions and a optimal rich color with a significantly lower price tag compared to their natural gemstone counterparts. In some cases, like alexandrite, natural options have become extremely rare. Lab created options may be the only way some admirers will ever be able to own a unique color-changing alexandrite. Lab created options allow us the opportunity to set a beautiful center stone into your ring without waiting for mother nature to create the perfect crystal. Contact Knox Jewelers today to learn more about featuring a lab created alternative as the center stone in your one-of-a-kind custom engagement ring. We will be able to provide you with the current availability of sapphire, ruby, alexandrite and emerald options. A lab created gemstone is a great way to feature a vibrant and clear center in your ring for a fraction of the cost. We would be happy to assist you in building your heirloom quality piece around the center stone of your choosing. 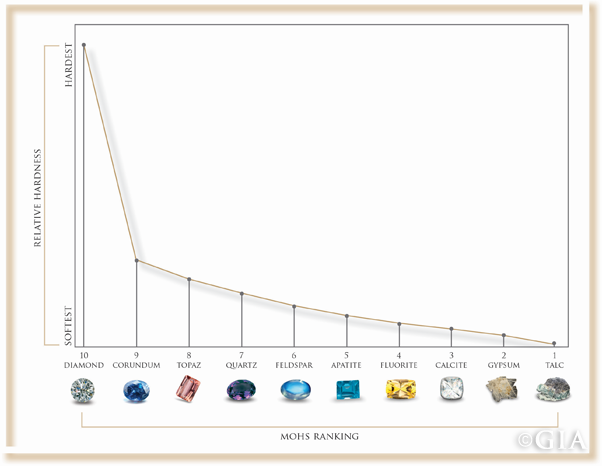 Created in 1812 by the German geologist Friedrich Mohs, the Mohs scale rates the hardness of gems and minerals. A gemstone’s hardness determines its resistance to scratching. He chose ten minerals and assigned them numbers based on how easy or difficult they could be scratched by the other minerals. Today, this scale is an important tool to utilize while shopping for diamond or gemstone jewelry. A Mohs rating helps us identify a gem’s durability, and the more durable a gemstone the greater its longevity in a piece of jewelry that will be worn on a daily basis. When consulting the Mohs scale, its important to remember that the gaps between the ten incriminates are not actually equal, even though they are evenly space on the scale. Diamonds are known for being one of the hardness substance on Earth, so hard, that they take the number ten position on the scale. Though only one seat away from corundum, diamond is actually 90 times harder in comparison. Corundum, which includes Sapphire and Ruby, is five times harder than Topaz which earns the rank directly below it. Based on the Mohs scale, at Knox Jewelers we always recommend diamond or fancy colored diamond first in engagement rings or rings worn everyday. Falling in second place, Sapphire, Fancy Colored Sapphire and Ruby are durable enough to be featured in engagement rings or wedding bands. Sapphires are a great way to add a little contrast to your engagement ring, they are available in nearly every hue imaginable. Gemstones rated lower than a nine are not recommended for everyday rings, they could eventually become scratched or scuffed from daily wear. The Mohs scale and hardness are not the only factor to consider when buying gemstone jewelry, but it is an essential factor to help you understand how well that gem will survive years of wear. At Knox Jewelers, we want your ring to last several lifetimes, and choosing a proper gemstone could aid in that longevity. If you have any questions about Mohs rankings or the jewelry creation process at Knox Jewelers, please be sure to let us know. We’re always happy to answer any questions you may have, and we look forward to working together with you to design a work of art that will last and be passed down throughout the ages. Contact our friendly and professional staff today, and we’ll get started on the journey of creating your very own, one-of-a-kind piece of custom jewelry.